When I look at the number of visitors to EAS (which is a reliable figure because it is derived from the server logs), it is a worrying development that between 2010 and 2012 the monthly visitor count halved from about 200,000 to no more than 100,000. The decline stopped a couple of months before STID was released in 2013. The counter went up a bit again and the figures have been more or less stable since then. I am looking for answers why EAS has lost so much ground, much more than after the end of Star Trek Enterprise in 2005, which I already addressed in the article Where Have All the Trek Sites Gone? in 2007. The reason for the more recent downturn can't lie with the content of EAS (that got updated as frequently as ever and was further consolidated), and I don't think that the campaigns against me because of my critical takes on the Abramsverse did have a lasting effect on thousands of visitors. Rather than that, I blame the radically changing usage of the internet during the past couple of years. So I was trying to find evidence of how it happened, and of how to boost the popularity of EAS again. This is not a commercial site, in which case a reduction of the audience by 50% would be a catastrophe. Still, I have a vital interest to prevent the site from slipping into total insignificance. In order to assess the performance of the site, it is interesting to check which content is most often accessed. It is no surprise that according to my server logs as of April 2014 the index page is requested most frequently and can be found on #1 and #3, because it is the page that people most often link to or have bookmarked. So far, so good. Positions #2 (guestbook.cgi) and #4 (signbook.cgi) are taken by the guestbook, which is unmistakable (and sad) evidence that a significant portion of the "visitors" to EAS are spambots. They access guestbook.cgi and then signbook.cgi, where they fail the anti-spam test that I set up. The Starship Database and the Starfleet Bridge Gallery are among the most popular pages with real content. They always rank among the top ten pages. While the Starship Database has been a key section of the site ever since 1998, for which it is renowned, the bridges have been the most often shared content since about 2008 (in blogs and forums but rather not in social media). New articles can always be found near the top of the list of the most popular pages. It obviously pays to highlight new content on the index page. Going down the list of pages, the big article on Classical Music in Star Trek by Jörg Hillebrand and me, a clear highlight of the site complete with sound files, can be found no higher than around position #40. It is currently advertised in the header of each EAS page, yet it is surpassed by many articles that are not new and that are far less visible. In anticipation of my analysis of the performance of EAS in social media, it is also worth mentioning that I have found just one link to this particular article on a conventional site, and no more than two shares in social networks. Speaking of social media, another letdown is that my efforts to bring Facebook, Twitter, Google+ and other dynamic content to the site remains largely unnoticed. I went to great lengths to process various RSS feeds from social media and other sites, many of which include daily updates, which are shown on the pages EAS Today and Trek Feeds. But these two pages are not popular at all; they barely rank among the top 50 pages, although they are on the top of the page listing on the EAS index page. So visibility isn't everything. I suppose that the typical visitor either has EAS bookmarked and is just looking for new content, or has followed a link and isn't really interested in the rest. In other words, guiding visitors through the site seems to be of secondary importance today, not to mention my failed attempt to offer a sort of Trek newspaper via embedded RSS feeds. Despite the repeated requests to improve the navigation of the site, this concerns only a minority of visitors who come to explore everything. Keeping everything on the site linked with each other is something that was still essential a couple of years ago and is something I will continue to do, but it isn't necessary any longer in a time where everything is found through search engines and increasingly through social networks. And indeed, many plain blogs and other types of sites (with the notable exception of wikis) don't care for intrasite links at all but are rather linked with the outside world. Rather than working on the navigation (where it would be futile to try to achieve the performance of Memory Alpha), it is important for me to have new content, and to have people who link to (new or old) content on EAS to attract new visitors. With updates at least twice a week, EAS fulfills the first requirement (there is no way I could work out still more). The problem in my view is that the updates and ultimately the very existence of the site remains totally unknown outside the realm of certain geeky blogs and forums. My statistics software compiles a list of the referrers to EAS. A sizable portion of visitors (around 30%) arrives via search engines, Google's share being over 90% of those 30%. Most of the rest (as many as 60%) have EAS bookmarked, which I believe is an unusually high (and perhaps worryingly high) percentage. Other links make up only 10% of the referrals, and the majority is from conventional sites or forums. Regarding Facebook, Twitter and other networks, it is not possible to distinguish individual URLs, as they are not resolved completely. I also launched a poll in April 2014, asking the visitors how they got to the website most recently. Such a poll can filter out bots, but it is clear that visitors who come to the site on a regular basis are more likely to vote than those who drop in only by chance. Hence, it is not representative and will most likely underrate the impact of search engines and overrate the option "Bookmark or directly typed in". 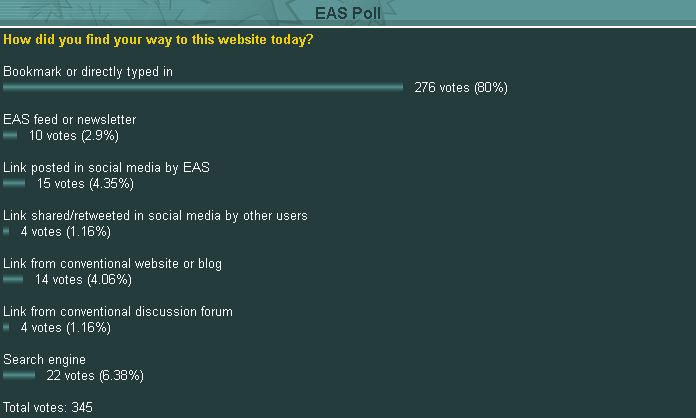 The first five or six votes after posting the poll, however, all went to "Link posted in social media by EAS". This is no surprise, considering that there are a number of loyal followers on Facebook, Twitter and Google+, and that new content in the EAS RSS feed gets automatically posted there almost in real time (with a delay of just a couple of minutes). But after less than one hour, there were almost no new votes from visitors coming from social networks. Most notably, almost no one chose the option "Link shared or retweeted in social media by other users". While I wouldn't expect anyone to share the link to my poll, there are always interesting topics at EAS that would be worth sharing. But as long as the poll was running (for about one week), only a negligible portion of the visitors seemed to come from a shared link, which suggests that no one bothered to share a link to EAS on social networks during that time and that practically no one clicked one of the few "old" shared links either. Once again, it is important to keep in mind that regular visitors are more committed to take part in the poll, and this may rather apply to my own Facebook followers than to those who were referred to EAS by someone else. Anyway, the outcome of the poll is that 80% of those who voted (with increasing tendency in the course of the first few days) come to EAS through bookmarks and direct typing of the URL. More generally, including those who clicked links or used a search engine, more than 90% find their way to EAS the conventional way, far less than 10% through social media, and only around 1% through shared or retweeted links to EAS. While the impact of the latter on EAS is currently totally negligible, it has the most potential for improvement - because the visitors from networks seem to be generally more committed than those from search engines. Various Google searches and social media searches (where possible, such as in Twitter) confirm that there are extremely few mentions of EAS in social media, except for my own posts. This is the biggest disappointment of my whole survey. EAS does have lots of content that is definitely worth posting, "new" as well as "old" articles. EAS still does have around 4000 visitors every day, many of whom are probably members in social networks and could easily grab a URL and tweet or post it. URLs at EAS (with very few exceptions) are self-explanatory and never change, unlike those of other sites (so no one likely encounters a 404 at EAS). I have taken many efforts to bring EAS to the social media and vice versa. While there are very few shares of EAS content, the Twitter, Facebook and Google+ accounts of EAS do have decent followerships. However, the Facebook page as the most important representation of EAS in the social media has eventually entered a phase of saturation. The number of likes doesn't rise since January 2014. There are just as many unlikes as new likes, and the number is stuck at 1678. It is plausible that only those people are likely to like the EAS Facebook page who also come to the site. The site obviously isn't gaining new regular visitors, and among the regular visitors all have either joined Facebook by now or have decided to stay out. Well, for reasons that lie in the structure of Facebook and in the lacking visibility of Facebook pages compared to personal profiles, most of my Facebook friends don't like the EAS Facebook page and perhaps don't even know of its existence. But I never bug people to vote for me in any fashion. I repost a funny picture by someone else, which takes me 30 seconds and gets 30 likes. I work on a big article, which takes me 30 hours and gets 3 likes. Is there something wrong with Facebook (and with other social networks), or rather with my expectations? Am I talking about two worlds that will never fit together? I think the principal reason for the demise of Star Trek sites (not only EAS), including more recent forms such as blogs, in the past few years is the radically different browsing behavior. Many people use social networks as a platform that they rarely leave at all, and they access the internet primarily with mobile devices. Everything that isn't presented as "new", that doesn't fit into a narrow column and that takes more than a minute to read is of little interest to them. Sure, I'm talking about an extreme type of a social network user. But I believe that, in one way or another, we are all influenced by social networks and their working principles, even if we visit them only occasionally. I don't think that people are stupid today and that they wouldn't want to read good articles or enjoy good artwork. The problem is that social networks are an additional (and a seemingly "democratic") layer of interaction that produces no content but serves to rate how good or how new something is and (for some people) to find content in the first place, without a need to browse any conventional sites. This principle discriminates against traditionally presented content and niche content by its very nature, and favors any kind of "content" such as funny cat pictures or "eating a pizza" tweets by celebrities. Well, most of the visitors of EAS (>90%) find it without social networks anyway, but this way the site is effectively locked out from the mechanisms of the internet. Unlike EAS, most companies can't afford to be locked out. They promote the development of networks, although they have almost no control over them. Companies urge their customers to visit them on Facebook, many neglect their own websites in favor of their Facebook pages, some have even abandoned their websites altogether (except for a placeholder that isn't updated any longer). In my case, it is clear that EAS must be and will always be in the focus of my interest. EAS is all about thorough investigation of the Star Trek Universe, something that can't take place in social networks. My website is the only reason why I am in social networks in the first place. I neither want to sell anything nor be involved in someone else's business. As already mentioned, it is hard enough for any kind of traditionally programmed website to get noticed in social media. Additionally, EAS is a strictly non-commercial fan website maintained by a single person. Several people have more or less directly expressed their dislike of my work, because they think that 1) sites that sell something or are at least sponsored have to be better, 2) I'm a pitiful nerd hanging around in the basement and whatever I'm saying is irrelevant or 3) the majority is always right anyway. This is more than a simple misunderstanding; it is a way of thinking that is being fostered ever since the internet has become commercial and perhaps increasingly in social networks. I'm sorry to say that and I may offend a couple of followers, but 90% of what the people I follow on Twitter and Facebook are posting is crap. It usually doesn't concern me in any fashion and isn't funny or interesting in any way. Much of it is even pure spam, often unwisely posted because someone forgot to uncheck something like a "Send this to all your friends" box. Whenever I visit celebrities on Twitter, I can be sure that even 100% is either inane banter or shameless advertising, and I'm likely to lose my respect for them. And although I am aware that friends following me on networks find new EAS content exactly that way (rather than by going directly to my Facebook or Twitter page), I myself avoid checking out my "personalized" feed with "news" from friends, in which messages with relevance are so rare. I have also turned off almost all e-mail notifications from networks because there are always much more important things for me to tend to than having the latest news from Twitter and Facebook. As I mentioned, I may still need to understand what other people find fascinating about social networks to be able to profit from them. Of course, there may be also Trek-specific reasons for the downturn. As I already mentioned a couple of years ago, Memory Alpha has made many conventional sites dispensable, but although it has the air of being "democratic" (as opposed to the the concept of EAS), I don't think the impact on EAS was as great as on database-type sites. Rather than that, there are probably Trek-specific demographic factors. Old fans continue to lose their interest for the franchise since 2005, while fans of the new Star Trek (or new fans of Star Trek) have found other places to visit, which may or may not have to do with my stance on the Abramsverse. The advent of the new Star Trek and of younger fans coincides with the aforementioned generally new understanding of the internet. My generation (meaning everyone over 35) discovered the old-style internet in the mid-90s and generally embraced all changes until a few years ago. However, very few people of my age that I know in real life care for social networks (except for professional networks such as Linkedin or XING), while it is my impression that for many young people networks are the hubs of their activities. So what can I do to regain or at least preserve the popularity of EAS? Post even more in social media: It is impossible to popularize my Facebook or Twitter account to a point that more people come to EAS from there than vice versa. Rework the site structure and code to be fit for the future: I will have to work on that, because some day browsers will not display the site correctly any longer. But it doesn't really help me make or keep it popular. Keep up my social network activities. Allow easy sharing of EAS content in social networks: I thought it was convenient enough without special buttons, considering that you just have to grab the URL and let the interface of your network do the rest. But I may have been mistaken, and visitors need to be motivated with buttons. I have included buttons that allow just to share content, because this is possible with simple links, while "liking" or similar actions require scripts that I can't control and that I generally don't allow at EAS. Please click the buttons on the bottom left of each EAS page and share the content in social networks. And keep in mind, old content becomes "news" once it gets shared somewhere (just as it happened with the starship bridges). I have received countless encouraging comments and suggestions after posting this article on April 27, 2014. Thank you! The activity on the Twitter, Facebook and Google+ pages of EAS has noticeably increased since April 2014. Thanks to the people who keep the discussion about EAS running! My "cry for help", however, had absolutely no impact on the number of visitors to EAS, which didn't even rise in the days of the highly increased social network activity about EAS after April 27. My conclusion is that only those people visit EAS through networks who would be coming anyway. If it were only for the visitor count, I could just as well close down the social network accounts of EAS and save a lot of work. But as already mentioned, they are valuable auxiliary platforms that I would like to keep. Even many regular users of social networks agree with me that Twitter, Facebook and Google+ are not suited for in-depth discussion of topics as it takes place at EAS and in the conventional discussion forums of my generation. "Social media does seem to be helping the younger generation evolve into a Pakled version of the Borg collective." My own posts on Twitter, Facebook and Google+ get shared a bit more often than a couple of months ago (meaning that perhaps one person shares each of them instead of no one). In the discussion at Facebook one visitor gave me a perfectly reasonable explanation for the reluctance to share stuff from EAS: "There's only one Star Trek fan among my Facebook friends, and he follows EAS anyway." The biggest disappointment, however, is that no one bothers to share content directly from an EAS page. In the three months since I added the "share" buttons to the bottom left of every page, I could find one (!) share of a page through that button on a social network (it was Twitter). In light of the obvious reluctance of visitors to share EAS pages it is ironical that a number of people complained about not being able to hotlink to pictures at EAS. I am aware how embarrassing it is to find that other people can't see the image whose URL you grabbed at EAS. But my stance that hotlinking is wrong hasn't changed. If you load inline images from the EAS server, you don't only steal my bandwidth but also pass my work as your own or as "public domain / author doesn't matter" (at least if you don't add an additional line "image from EAS"). Online communities have a long history of undermining the rights of the actual content providers, and so far I rather deterred a few visitors than give up my resistance against this practice. Some social networks such as Facebook show how it can be done better: You input an image URL, Facebook saves a copy of that image and also adds a textual credit to the original website. Why can't other communities, and especially discussion forums, do the same? And even if they don't save a copy, the least they could do is give the real content providers due credit. It could be accomplished with a single line of code. Well, I'm thinking of changing my hotlinking policy in spite of everything, since slightly higher hosting costs and server load are not an issue for me. I currently maintain a positive list of places that may hotlink to EAS. I may change that to a negative list when I find some time (regular expressions are nasty, especially if a single wrong character produces a 500 on the server). The design of EAS has been criticized as old-fashioned and unsuited for mobile devices. I may change a bit about the former but not about the latter, because that would require a total manual recoding of the whole site to be able to create a mobile CSS. And while I generally take the criticism about the design seriously, comments such as "EAS looks so 1999, that's why I don't go there" or "It's such an old site, I didn't even know it was still being updated" (both slightly paraphrased) only show that I will never be able to please everyone. How can I reach such a person? I mean, I have an index page that announces updates as often as twice a week, I have an RSS feed, I'm on all the essential social networks, people link to new EAS articles on message boards all the time. I couldn't possibly do even more to let the fandom know I'm still alive. People even complained about EAS not having a search function, although it has existed for more than ten years (and can be found on every page for as long as eight years)! Sorry, but there is nothing that I can and want to do against such ignorance. Speaking of criticism that I don't share, some people complained about EAS being hard to navigate. EAS has in-depth content, in contrast to the vast majority of other websites that are still being updated and especially the more recent forms such as blogs. I can understand the call for more context-specific links on EAS, like they can be found on Memory Alpha. I can understand the desire to read short and mobile-ready articles like in a blog. But my critics apparently expect me to give them the best of three worlds: in-depth articles that are heavily linked with each other and with encyclopedia entries, and all this in an easy-to-consume format that is optimized for all kinds of platforms and for social media. This is utterly impossible. It is something that no site in the world will ever offer! Moreover, it is something that people apparently don't demand from other websites, not from Wikipedia, not from Facebook and least of all from any other personal website maintained by a single individual. I admit that pertaining to the look and the navigation, EAS may have a massive perception problem. But I don't know whether I can and want to do much about it. Actually, no one could specify exactly what is wrong about EAS except that, as already mentioned, some expect it to look and work like a "modern" site. Personally, I find conventional websites more accessible than the navigation as it is common today. I like menu bars instead of heterogeneous elements that are spread across the page and that move in unpredictable directions once you hover above them. I like link lists or site maps compiled by human beings, rather than automatically created navigation that points me just to the "Popular Topics" or something like that. I like sites that are structured with real categories and sub-menus, rather than the all-pervading blog format with its randomly assigned tags (if the author uses tags at all). On Facebook and in other social networks I often notice that buttons and fields don't give me the expected result. Endless scrolling of a page once you reach the bottom is another thing that puts me off. And I absolutely hate it when I click or only move into an empty region and yet something happens. Today's users may see things differently, but I am all for well ordered GUIs that tell me what I'm getting, and that's why EAS will stay that way. My index page may be overburdened with links according to the current laws of web design, but I personally don't see the reason to hide links to the categories behind animated menu bars, or even to remove category index pages altogether and make content only accessible via date or tag search. One suggestion that was put forth in the discussion about the navigation proved to be very fruitful though. I recognized the usefulness and the feasibility, and added a sidebar to each article, with links to related pages. It would have been a bit easier with a CMS software, but writing this script from scratch while keeping the page structure intact was clearly more fun and is something I can be proud of (although I won't be surprised if it will be totally ignored just like my scripts for the Trek Feeds, the gallery view of pages and the social sharing buttons). While a CMS is absolutely out of the question, I may change the update list to a real blog that people are perhaps more likely to read or to link to than my long and perhaps too dry articles. Regarding the Trek-specific reasons why people don't come to EAS (and perhaps even actively boycott the site), it was suggested that my stance on the Abramsverse movies has something to do with it. I don't believe this is the case. There are some anti-EAS threads with namecalling on message boards, but I think that bad publicity is better than none at all. And it isn't like my site is subtitled "I hate the Abrams films" anyway. Even for those who don't like and perhaps don't even want to read my takes on the Abramsverse, the rest of the site may be still worth visiting. Yet, several visitors told me that they used to visit EAS more frequently as long as there was still fresh Star Trek on TV (which would have been until 2005), and lately they were either unwilling to engage the Abramsverse and hence lost a bit of their interest for Star Trek, or they were seeking news of a kind that EAS doesn't offer. Also, Trek-related message boards, from where many people used to visit EAS a couple of years ago, seem to be on a steady decline since the end of Enterprise, and the new Trek films only temporarily re-invigorated the discussion. It is clear that EAS is a niche site for Star Trek fans. It has everything about starships, technology and continuity issues. It has an according reputation in the inner "nerdy" fan circle, but is totally unknown among casual fans. Casual fans are usually looking for some kind of news, and the Trek news sites are getting all the traffic, even if they only report on petty things such as a new Trek-themed bottle opener or rumors of Shatner being in the next movie. Frankly, even if I had a blog suited for that kind of content and a staff to write for me, I still don't feel like posting such banalities, only to have something new every day. Also, I am against advertising in any fashion. If I want to report on new movies, games, books or other merchandising on a regular basis it has to be mostly favorable, or no one would talk to me. The next logical step would be getting ads or even posting paid news. Unlike me, many EAS visitors probably wouldn't mind if the site became commercial. It is an increasingly worrying observation anyway that companies (in the form of the social media themselves, but also of companies advertising and posting within the social media) are not only taking over the whole traffic of the internet and are keeping people confined within their realm of influence. In addition, my impression is that the trust in these companies and in their online services is always growing despite the frequent news about data leaks, while handmade sites of individuals such as EAS are increasingly frowned upon as "personal sites that don't matter" or even as some sort of "Dark Side of the Internet - better stay out". Well, regarding new content, I could imagine posting interviews with notable Trek people, but that is something I probably can't do on my own. I'd have to enlist the help of someone who keeps in touch with the people, preferably from the Los Angeles area. I am currently thinking of writing a series of light-hearted illustrated articles of the kind "The 10 Ugliest Starships" or "The 10 Most Controversial Episodes". I think it will be fun, and I'm not only doing it to attract more visitors.